If you want to make a statement then the Thrill Experiences' solid gift box is just perfect. It's A5 in size, with a magnetic closure mechanism, lift out card and red ribbon. A professionally printed glossy folder contains all the details about their big day plus a special message from you. A credit card sized PVC voucher that's printed with their name on. Make it personal with a nickname. It's all up to you. Their name can be their full name, their first name or a nickname. It's all up to you. 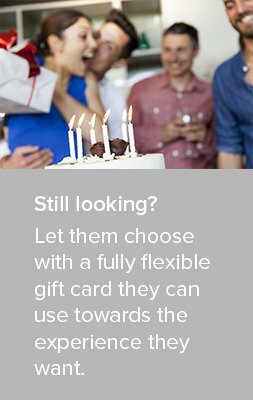 From the personalised gift card, your own special message and a professionally printed glossy folder with all the details. With each order, select one of two gift packs or simply have the details sent via email as an e-voucher. Whichever you choose, you can add your own special touch. Sleek and magnificently presented in a sturdy, matt red gift box. Everything about this pack accentuates quality and promises that you are about to experience something truly exceptional. Once opened you'll find a gloss folder containing all the essential details, a personalised gift voucher, inspriational ideas and a card that can be personalised with your own special message or left blank for you to complete. Included in the pack are details about the experience; with specific information about times, numbers, what to wear and other useful information for the special day. The pack is delivered via Australian Standard or Express Post. It can be sent to you or, if you prefer, directly to the person it's intended for. The Thrill Experiences Folder contains a full-colour, professionally printed A5 folder. It includes a personalised gift card and voucher plus all the details about the experience. Like a credit card, the voucher is PVC. Not only does it look great, it's also personalised with their name on. The e-voucher is sent to your nominated email address within 10 minutes of placing an order. It's super quick and can be personalised with your own special message. Orders are despatched the same day, if your order is received before 3pm, Monday to Friday excluding public holidays. So that you know whether it is best sent via super fast Express Post or via Regular Post, we include an estimate of the time it will take to get to you. Regular Post items can take 2 to 7 days whilst Express Post items are delivered next business day where your delivery address is within the Express Post network. A postage tracking code is sent to you via email as soon as your experience is shipped, so you'll know when to expect it.